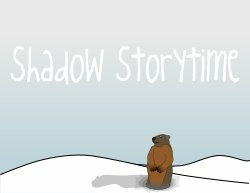 I thought much of the content that I'm currently working on for my winter shadow puppet show would adapt easily to a great preschool storytime theme. I love the idea of doing this in late January or early February for Groundhog Day. You can also hang a plain sheet up and let the kids practice making shadows in front of the audience. Photo opp! A fun activity for slightly older kids would be to team them in pairs and have them take turns pretending to be each other's shadows. We used to do this in drama club.